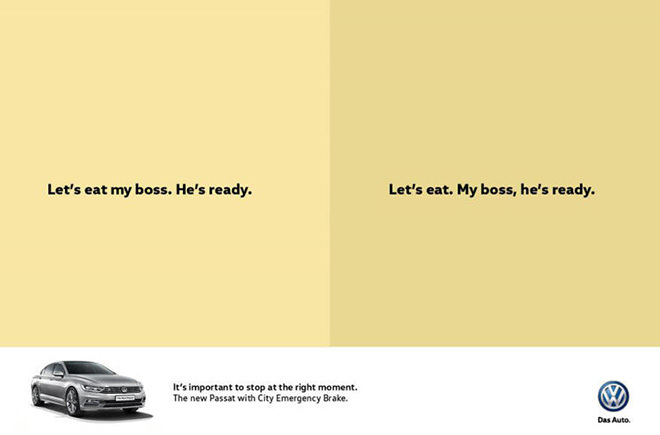 Volkswagen recently unveiled their marketing campaign promoting their Passat model. The ads focus on the Passat’s reliable and safe brakes. They do this in a very clever, clear, and humorous way. The main message that is showcased is the importance of “stopping at the right moment” and the brand uses crucial punctuation in sentences to make their point. The ads leave you convinced that punctuation, and a reliable break, are a critical aspect to not only a sentence, but the vehicle you drive! We love this clever and creative message! Need help with your next campaign? Contact us today!